Let’s face it, Macbeth’s biggest problem is its ubiquity. Easily the most accessible of Shakespeare’s plays – and arguably one of the most powerful – we’ve seen so many average versions of it over the years (amongst which I am inclined to include Justin Kurzel’s 2015 film adaptation) that a production really needs to do something very special with the source material in order to make it an enticing proposition. I’m therefore delighted to say that the National Theatre’s latest production, directed by Rufus Norris and seen here via a live cinema linkup, does exactly that, giving us a Macbeth that rivals the very best of them. It almost goes without saying that both Rory Kinnear (in the title role) and Anne Marie Duff (as his manipulative wife) submit exceptional performances, giving those oh-so-familiar lines enough oomph to make you feel as though you’re actually hearing them for the first time. No mean feat. But it’s the production design that really shines. This version takes place in what might well be a post-apocalyptic world, where a civil war has just been bloodily disputed and where everything has a grungy ‘make do and mend’ look. Severed heads are proudly displayed in supermarket carrier bags, food is served in battered mess tins and even Macbeth’s armour is contrived from found items battered into shape, which have to be literally gaffa-taped onto him before each battle. Duncan (Stephen Boxer)’s royal regalia comprises an ill-fitting red velvet suit, that might have been salvaged from a charity shop. It provides the one splash of vibrant colour in an otherwise drab and scuffed world. Production designer Rae Smith has created a huge wood and metal arch upon which much of the action plays out. It somehow contrives to be both heavily industrial yet strangely ethereal as it swings silently back and forth. It is poised over a revolving circular stage, so that each successive scene can glide effortlessly into position. In one sequence, the Weird Sisters move with the turning of that central wheel like the protagonists of a particularly disturbing nightmare. There’s some great use of regional accents: Trevor Fox’s Porter is a dour Geordie; Patrick O’ Kane’s MacDuff a pugnacious Irishman. Oh, and the element that lets down so many stage productions – that climactic battle – is delivered here with enough zeal and gusto to be truly convincing. You’ll believe that a head can be bloodily severed. Of course, if you’re reading this and you weren’t at last night’s showing, you’ve already missed your chance to see the live broadcast, but the good news is that the production is heading out on a UK and Ireland tour from late September, so – if it’s showing anywhere near you – do take the opportunity to see it. It will serve to remind you that Shakespeare, when convincingly done, can be truly and utterly enthralling. OK, so it’s yet another Shakespeare adaptation. And it’s Macbeth too – one of my favourites, but certainly not one that’s under-performed. Its length and relative simplicity make it a school curriculum staple, so regular airings are always assured: it’s an easy one to sell out. But it’s this ubiquity that means it’s in danger of being – dare I say it? -boring. I’ve watched and read this play so often that, unless the director is bringing a fresh eye to it, I really don’t want to see it again. Especially after the recent much-acclaimed-but-actually-rather-dull film version, by Justin Kerzel (see previous review). Luckily, Carrie Cracknell and Lucy Guerin’s production (for Home, Young Vic and Birmingham Rep) certainly brings that fresh eye. It’s not perfect by any means – there are a few jarring moments, and some lines that seem misjudged (that long pause between ‘hold’ and ‘enough’, for example, turning the latter into capitulation instead of a defiant battle cry), but it’s dirty and dangerous, just like it needs to be – and it’s sharp and witty too. It’s set in a version of the present, in a stark underpass, as grim as night. There are flickering fluorescent lights, and a sense of menace prevails. The body count is high, and murder is rife; the corpses are wrapped in plastic and tossed aside quite casually. This is certainly a brutal world. And the witches. They’re my favourite thing. They’re twisted, haunted mannequins, moving their inhuman limbs in a foul and fearsome dance. They’re genuinely frightening, like horror-story dolls – sometimes pregnant, sometimes breast-feeding – and their gruesome game of Blind Man’s Buff makes the Macduff family murder a truly awful act. The banquet scene is nicely done; Lady Macbeth’s madness is also a high point. It’s a strong production: daring and innovative and certainly not dull. Highly recommended – although I suspect it will divide opinion. Macbeth has been filmed many times with varying degrees of success. Indeed, the story is so familiar there’s no point at all in describing what actually happens, since it is indelibly imprinted upon most people’s consciousness. Yet every single film made thus far has overlooked a really important opportunity. Macbeth and his wife need to be teenagers. Only the overbearing hubris of youth and rampant ambition can ever fully explain their actions. Of course, when you’re in the business of financing a movie, the simple truth is that you need names that will put bums on seats, so the chances are we’ll never get to see such an interpretation on the big screen. Which is a shame. Here, Michael Fassbender gives us a grimy, muscular Macbeth, while the usually dependable Marion Cotillard struggles somewhat with her Scottish accent as his scheming wife. If you’re going to film this play, you really need to have something different up your sleeve and apart from a few neat flourishes, director Justin Kurzel doesn’t have an awful lot to offer us. He opens with the funeral of the Macbeths’ young son (something alluded to in the text but not, to my knowledge, ever shown before) and then he gives us a big slow motion battle, set against some bleak highland scenery. The witches are nicely restrained (some of their most famous lines summarily dispensed with) and from there, matters proceed at a funereal pace, with Fassbender and Cottilard reciting their lines whilst gazing into the middle distance, like actors in an Ingmar Bergman film. It isn’t terrible, you understand, but the leaden quality rather neuters this most virile of Shakespeare’s plays, making you long to push on to the next action sequence, rather than relishing those wonderful words. There’s also a terrible misstep when Macbeth appears to discuss the assassination of Banquo (Paddy Considine) as the entire court listens in. It must have been Kurzel’s intention to do it this way, but it looks, frankly, risible. 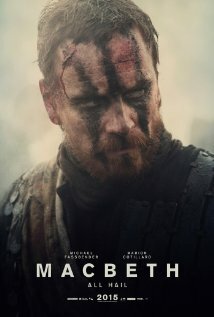 The closing sections, in which the avenging forces set fire to, rather than transport the woods of Dunsinane, finally allow a touch of awe into the proceedings and the confrontation between Macbeth and Macduff (Sean Harris) is visceral enough to ensure this probably won’t be suitable to show in schools. There’s also a nice twist at the end involving the King’s sword – but by this time, it’s a little too late to salvage proceedings. Advance reviews for this had led me to expect something extraordinary, but overall this felt like just another version of a tried and tested story. Decent but not a game changer.